Last month we showed this picture of two cottages on the site of the current library. This resulted in letters from two (very) long time village residents. The first from Milford Jeeps and the second our “regular correspondent” who likes to be anonymous. “These cottages, including the two adjoining brick built cottages facing into Rockmill End belonged to and were demolished by Maurice Manning about 1930/1 all by hand with Horse and Cart and I visited the site regularly. 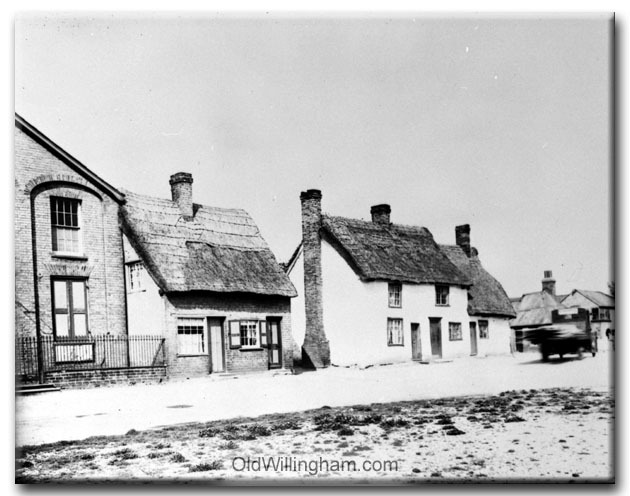 The only bricks (mainly in the chimneys) were taken across the road to Mr. Leach a local builder whose property was on the opposite corner and can be seen over the vehicle in the picture, the Thatch was burned on site and the walls which were “Clunch” were taken away in the Cart. Mr. Manning first sold a side access to the Wesleyan Chapel since, as your picture shows, the properties joined. Until then, all the facilities at the rear had to be serviced through the Chapel (including the then traditional Toilet bucket.) He later sold the rest of the site including the remaining cottages to the Gas board who built the new Showroom and used the cottages to house their local fitters. The white house with the prominent chimney is where Winnie Jeeps was born and lived up to demolition. After the war she became Mrs. “Ted” Williams well known as keepers of the Milkmaid Pub. The traditional stone step up to the front door of one cottage was found to be a reversed gravestone which was then taken to Willingham Churchyard. The rector was going to check if it was from here and if any relatives were still alive since, even at that time, it was very but I don’t know what was the outcome.